Is unbridled self-interest the optimal guide to material well-being? Or does enlightened self-interest require a quest for mutual gain? Steven Pearlstein answers “no” to the first question and “yes” to the second. Exploiting the commons for private gain can benefit a narrow segment of the population for a time but tends to bankrupt the entire society. Many supporters of President Donald Trump endorse him and his policies, even when they do little to help 99 percent of the people. Still, only 60% of Americans aver that a free market economy is the best system—down from 80% a decade ago. Indeed, another poll showed that a majority of millennials would prefer to live in a socialist country rather than a capitalist one. Why these trends? Pearlstein argues that our society is caught in a self-reinforcing downward spiral in which the erosion of social capital, government dysfunction, rising inequality, and slowing rates of economic growth are feeding off each other. To break this cycle, Americans need to embrace a different form of capitalism. We need to devote less attention to means (such as taxes) and more to ends (such a community and justice). Is greed good? Pearlstein summarizes both the pros and cons, beginning with divergent views of the “invisible hand” in two books by Adam Smith. A major reason why greed is bad derives from the priority given in recent decades to rewards for managers and shareholders. From 1932 to 1977 managers strove to share the wealth with employees and customers as well as shareholders. Since that time managers are no longer treated as trusted professionals but as free agents who must be bribed. The decline of mutual trust in seen in many spheres of society (including the gun culture) and exerts heavy costs—in social capital as well as financial gain. Pearlstein writes for the Washington Post and teaches public policy at George Mason University. He is not a Ph.D.-type economist, but he reads widely and aptly summarizes what academics such as Edward Banfield, James Coleman, Amartya Sen, and Robert Reich have written about trust and income distribution. He explains the Gini coefficient in reader-friendly terms and then presents easy-to-read tables showing the distribution of wealth and income around the globe. He examines the difficulty of assessing a fair income for LeBron James, whose basketball performance inspires people to pay big money out of all proportion to what most athletes or McDonald’s employees earn. The winner-take-all dynamic of compensation applies to any market in which reputation as plays an outsized role. Pearlstein laments trends toward greater inequality in wealth and income, but he argues at length that much inequality is due to nature—the genes we inherit and the ability and willingness of parents to bring up their children to succeed. Still, upward mobility has decreased in the United States due to many factors. It is far less than in Scandinavian countries and Canada. Poor schools for poor children is a key culprit. Defenders of present-day American capitalism argue that some inequality is the cost of a system whose growth expands the economic pie to benefit most people. 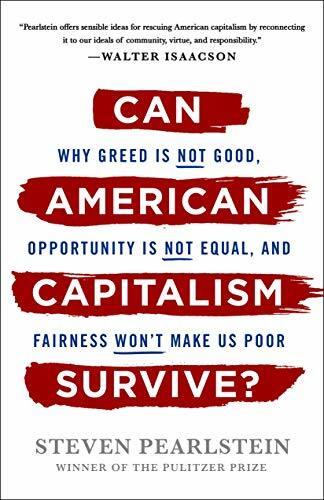 Pearlstein argues, however, that growth versus fairness is a false choice. Having considered a host of arguments by conservative as well as progressive economists, Pearlstein aligns with an International Monetary Fund study that concludes incomes could be made more equal without hurting economic growth. • End class segregation in public schools. The list goes on, but one of the most far reaching recommendations is to follow the lead of more than 2,000 companies around the world including Etsy, Patagonia, and Ben & Jerry’s and reestablish profit-making corporations as B Corps. A benefit corporation’s directors and officers operate the business with the same authority as in a traditional corporation but are required to consider the impact of their decisions not only on shareholders but also on society and the environment. Thus, benefit corporations differ from traditional C corporations in purpose, accountability, and transparency, but not in taxation. Pearlstein ask for more thoughtful moralizing—not less. He aligns with Adam Smith who understood that the wealth of nations depends on the vigorous pursuit of self-interest by individuals whose self-seeking is tempered by moral sentiments such as compassion, generosity, and a sense of fair play. An economic system that ignores these sentiments forfeits its moral legitimacy and, in time, its prosperity as well. Pearlstein has written a book that underscores difficult economic and social problems and suggests how to confront them with policies that are moral as well as practical. He ends by quoting Robert F. Kennedy in 1968: Gross domestic product does not measure our wit or courage; our wisdom or learning; our compassion or devotion to country. It measures many things except what makes life worthwhile. This book is full of deep insights and good ideas. Will any of them bear fruit at a time when reason is in retreat and the administration wages trade wars that most experts see as bad for all parties? What the president praises as clear-minded “patriotism” many analysts see as myopic chauvinism.